Dr Price, who directs excavations at the Qumran plateau in Israel, the site of the community that produced the dead sea scrolls some 2,000 years ago, expertly guides you through the latest archaeological finds that have changed the way we understand the world of the bible. (Part 4 of 6 in the film series The Stones Cry Out). From time to time you will read articles in the Arkansas press by such writers as John Brummett, Max Brantley and Gene Lyons that poke fun at those that actually believe the Bible is historically accurate when in fact the Bible is backed up by many archaeological facts. The Book of Mormon is blindly accepted even though archaeology has disproven many of the facts that are claimed by it. For instance, goats did not exist in North America when they said they did. Goats are mentioned three times in the Book of Mormon placing them among the Nephites and the Jaredites (i.e. between 2500 BC and 400 AD). In two of the verses, “goats” are distinguished from “wild goats” indicating that there were at least two varieties, one of them possibly domesticated or tamed. Domestic goats are known to have been introduced on the American continent by Europeans in the 15th century, 1000 years after the conclusion of the Book of Mormon, and nearly 2000 years after goats are last mentioned in the Book of Mormon. The aggressive mountain goat is indigenous to North America. There is no evidence that it was ever domesticated. Isaiah 44:28 Who says of Cyrus, he is my shepherd, and shall perform all my pleasure: even saying to Jerusalem, you shall be built; and to the temple, your foundation shall be laid. Verse 28: Who says of Cyrus: The record of the decree to rebuild the Temple can be found in 2 Chron. 36:22, 23; Ezra 1:1, 2 with several other references in Ezra. The precision of the prediction made by Isaiah about 720 BC concerning events following 536 B.C., more than 184 years later is illustrated here and by the subsequent history. 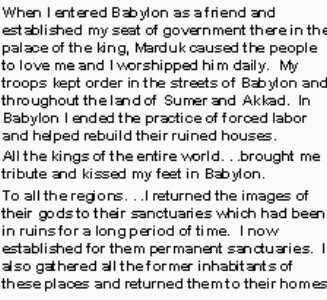 Cyrus reversed the policy of moving and resettling captive nations in unfamiliar places to keep them submissive, which policy had been started by the Assyrians and improved on by the Chaldeans. Ending this period, Cyrus declared the policy of restoring the captive nations to their homelands where possible. There is a well preserved cylinder seal in the Yale University Library from Cyrus which contains his commands to resettle the captive nations. Cyrus died within 5 years of the decree to rebuild Jerusalem and thus he served YHWH exactly as the prophecy says. Cyrus commanded the return and rebuilding and that the Temple be “founded.” He did not live to see the Temple built nor the structure to rise above the foundations. So precise is the prophecy! A translation of a portion of the Stele follows. A massive tsunami engulfs a residential area in Natori, Miyagi Prefecture, northeastern Japan. A magnitude 8.9 earthquake struck off Japan’s northeastern coast this morning. As well as damage from tremors, 10-metre high waves have caused devastation. My sons Wilson and Hunter got to go to Grace Community Church on Sunday and heard Dr. John MacArthur speak.